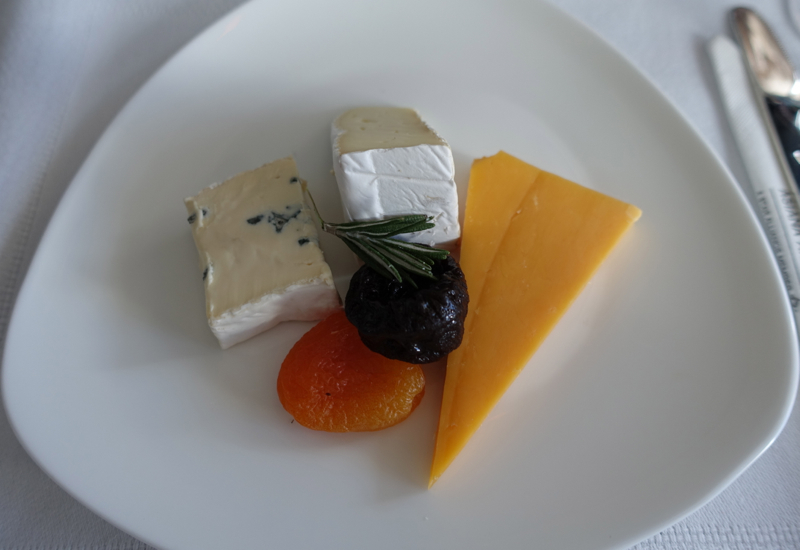 This Asiana First Class Suite Review is part of a trip report covering luxury travel in northern Thailand and Siem Reap, Cambodia. 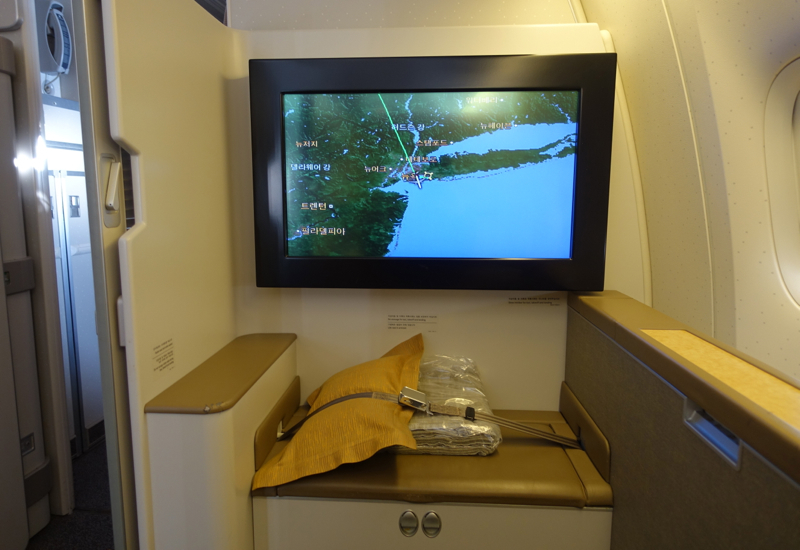 For the prior post on JFK lounge access when flying Asiana First Class, please see SWISS Lounge JFK Terminal 4 Review. 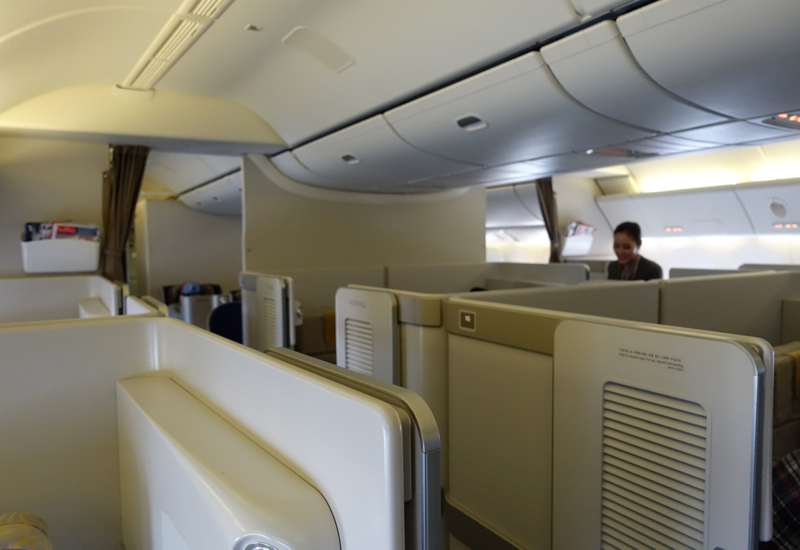 In terms of the product, I knew what to expect, since I flew Asiana First Class earlier this year, on our way back from a fantastic stay at Amanjiwo, and after Asiana Business Class from Bangkok to Seoul. 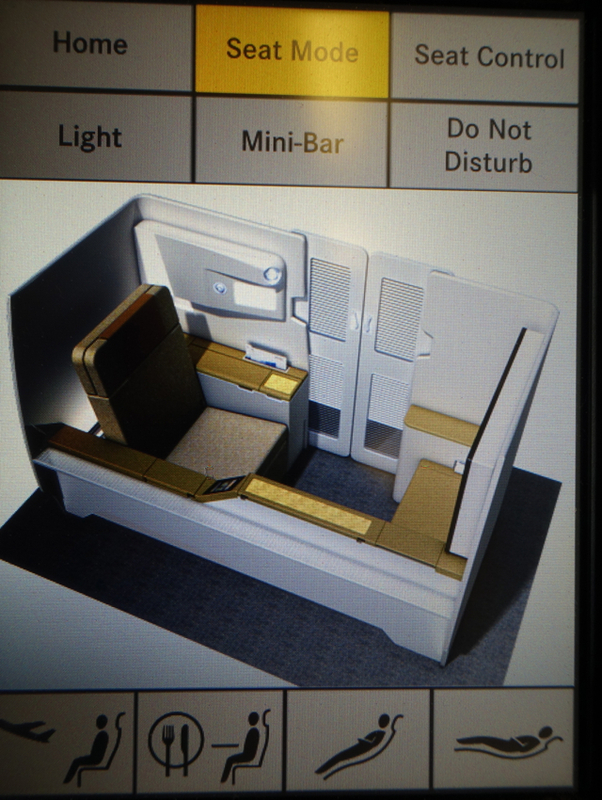 On the 777-300ER, Asiana First Class has 8 enclosed suites in 1-2-1 configuration in rows 1 and 2. Originally I was booked into 2G, since the 2nd row window seats were taken and the 1st row was blocked. That said, I was able to change my seat to 1K at the airport, and also change the seating for my husband and son for their flight the following day. All the seats are the same in terms of dimensions, but I and most passengers prefer window seats if traveling solo. And even if traveling with a partner, if one of you prefers a window, there's no reason why you shouldn't book a window and middle seat across the aisle from each other, especially since you can dine together by sitting across from each other, one of you on the ottoman. Asiana has a good but unspectacular first class seat. It's not super wide, as Cathay Pacific First Class seats are, and the fabric upholstery, in my view, makes it less luxurious than leather upholstered seats such as in Singapore Suites, Singapore First Class, etc. The seat controls are via touchscreen, and while I prefer to have both manual and touchscreen seat controls, at least on the 3 Asiana first class flights my family has taken, there haven't been any issues with the touch screen seat controls. There's convenient storage space underneath the ottoman; just remember that this space isn't accessible once you make the bed. 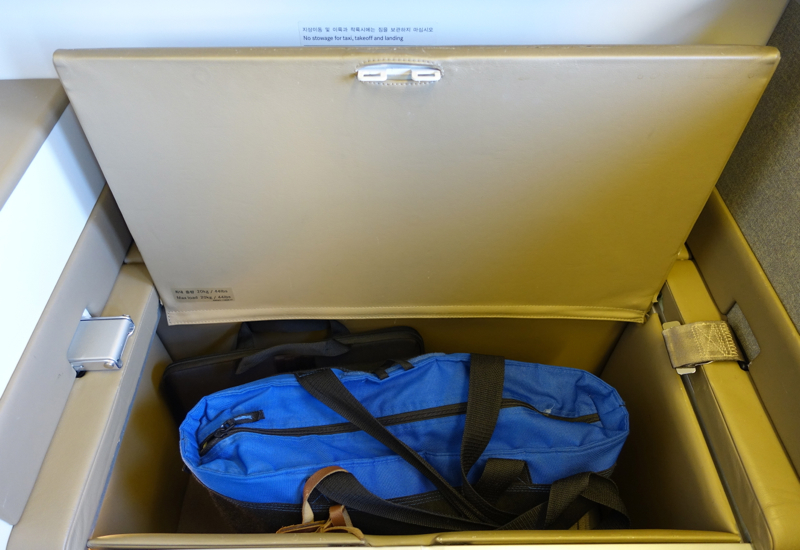 For items you want to keep within easy reach, including when the seat is reclined into a fully flat bed, there's a compartment on the right. 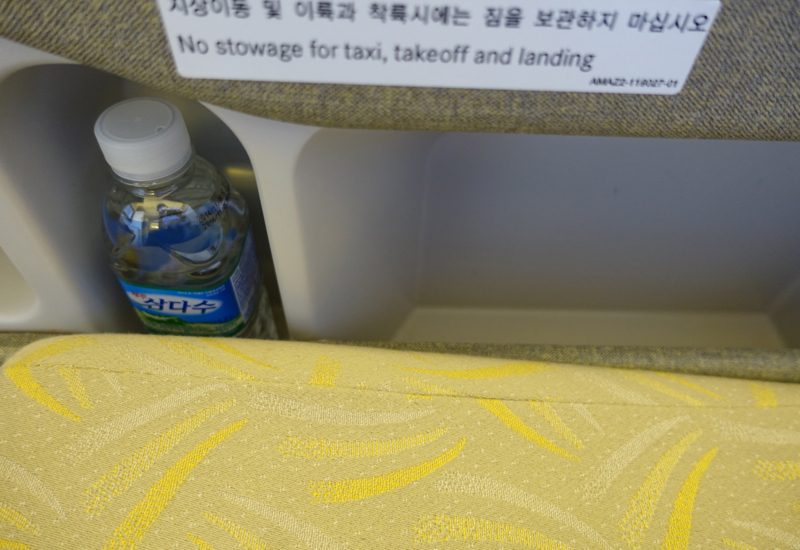 I was happy to see there was already a bottle of water there, since staying hydrated on long flights can be a challenge. While it's something I personally don't care much about since I tend not to use the IFE much, Asiana First Class Suites do offer one of the larger high definition screens: 32 inches. 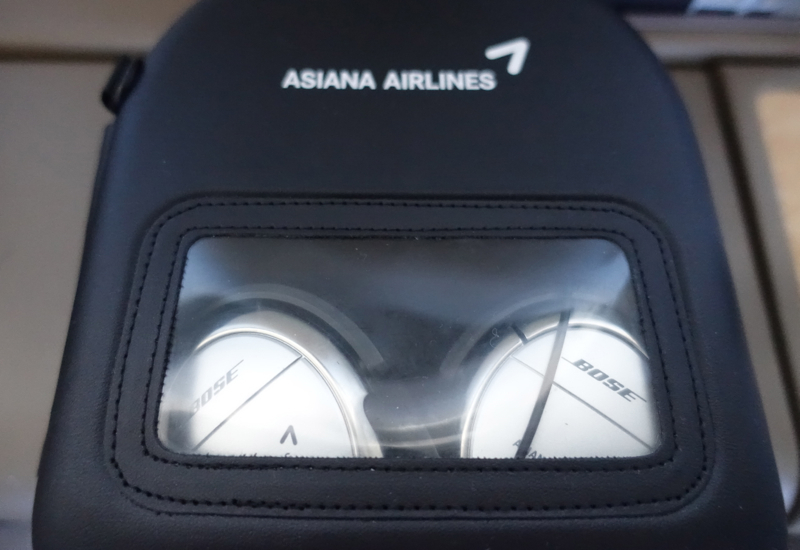 Asiana supplies Bose Noise Cancelling headsets, an expected amenity for first class. 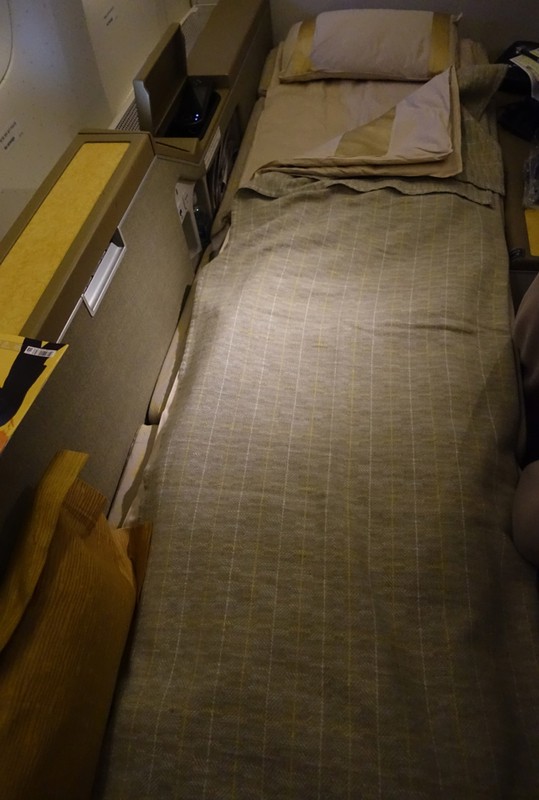 Asiana's first class pajamas are in a beige color, in keeping with the neutral color scheme of the first class seats, although the top has some visual interest from the gold thread design woven into the fabric. 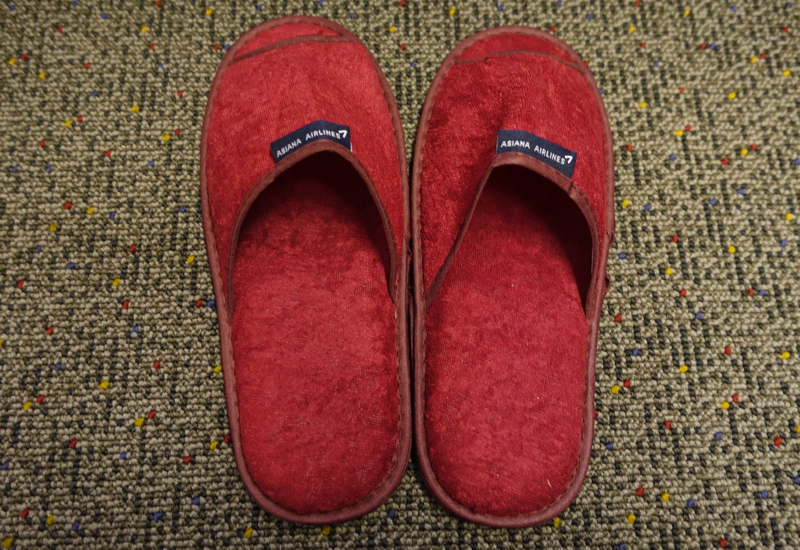 They are of a thicker material than most first class pajamas and have stood up well to multiple washes at home. While not as stylish for women as Etihad First Class pajamas, they do make good loungewear, except that the pajama bottoms are rather short in the leg–more like culottes, on me at least. Asiana's amenity kit with plenty of Bulgari products is one of my absolute favorites. In addition to a toothbrush/toothpaste kit and comb, it includes a number of Bulgari products with its white tea fragrance: a scented moist towelette, facial cream, hand cream, body lotion, after shave lotion, lip balm and perfume. Perfect to bring with you, in case your hotel's bath products are underwhelming. 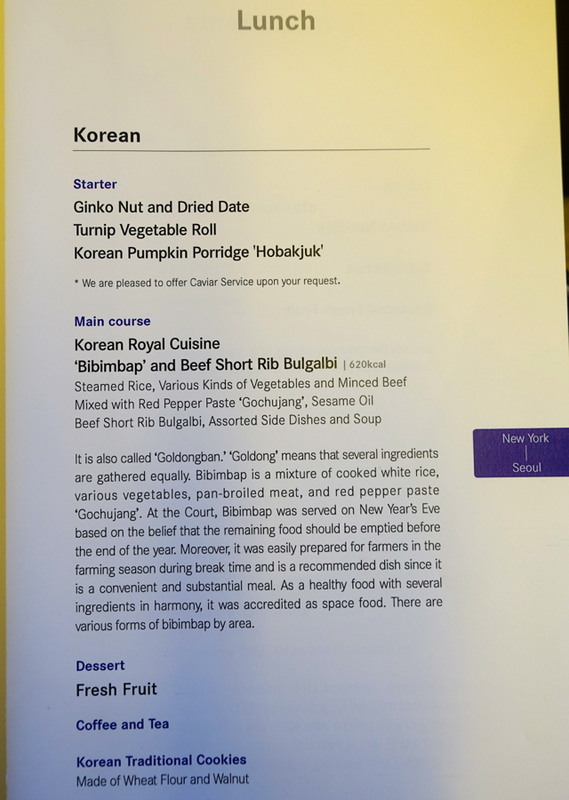 On my last Asiana First Class flight I sampled the Western menu, which was excellent, so on this occasion I decided to go with primarily Korean menu options. The dining table, which was on the right arm rest and pops up after you depress it, was nicely set for lunch, with a red carnation. Not quite the romantic touch of a Lufthansa First Class red rose or the elegance of an orchid adorning your seat for the entire journey as in Cathay First Class, but a flower is always a welcome touch. 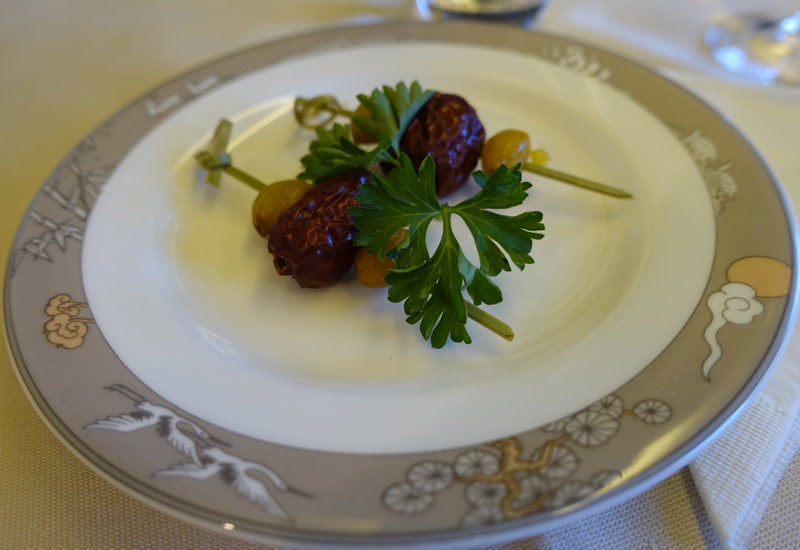 The first starter was Gingko Nut and Dried Date, and perhaps I just don't have the correct Korean tastebuds, but I didn't care much for it. 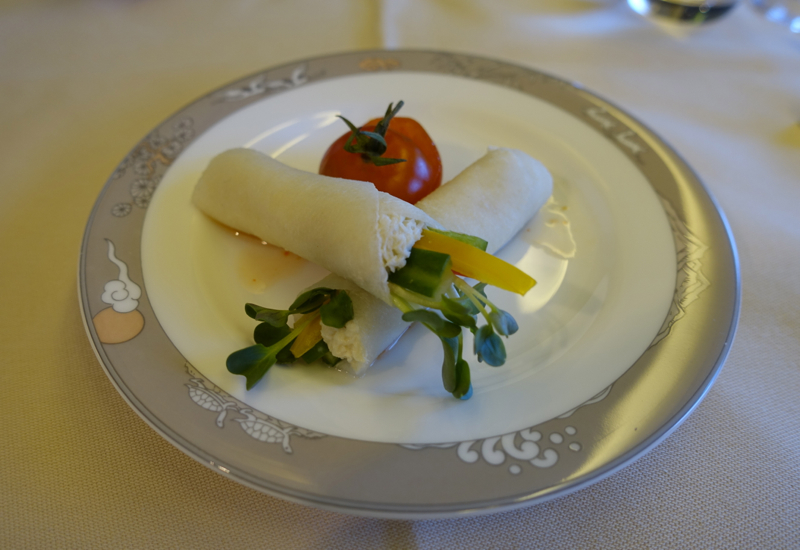 I enjoyed the Turnip Vegetable Roll, the second starter, more, as it included some nice fresh crab meat. 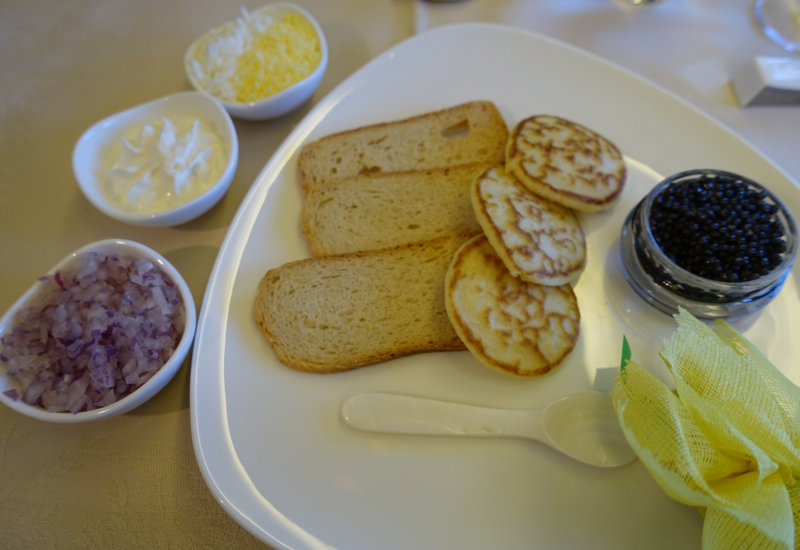 Even if you've ordered from the Korean menu, you're also able to enjoy caviar service, which I did. 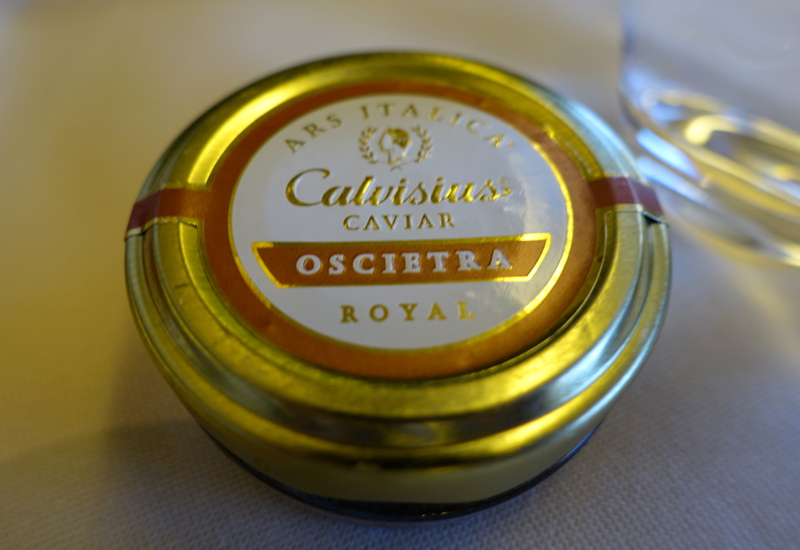 Asiana serves Ars Italica Royal caviar–a full jar–which retail would be over $100. It comes with the typical accompaniments of finely chopped egg white, egg yolk, onions, creme fraiche and blini, and was delicious. The main course, Korean Royal Cuisine Bibimbap and Beef Short Rib Bulgalbi, was delicious, including the variety of ban chan (little side dishes) that come with it. I will say that it would have been even tastier if I'd realized earlier on that one of the dishes contained sesame oil to be mixed in; in restaurants I've never had sesame oil come separate from the bibimbap, so I only mixed in the spicy chile paste. Even without the sesame oil it was delicious and I finished all the included meat and vegetables (although not all the rice, which is a very generous serving). The Korean Menu always features fresh fruit for dessert, which is no doubt the healthiest option, but I asked to try the Raspberry Cake instead. 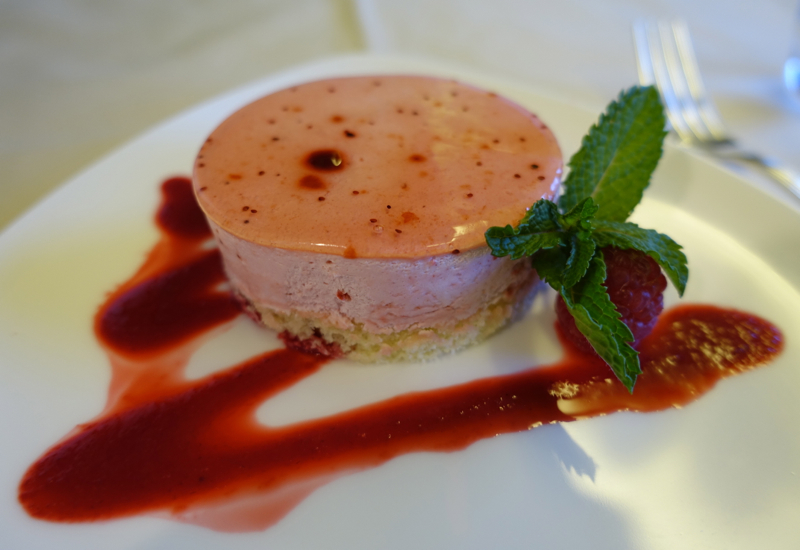 It was beautifully plated with some raspberry coulis, and was a mousse cake. This is no doubt great for storage purposes, but unimpressive as a dessert. 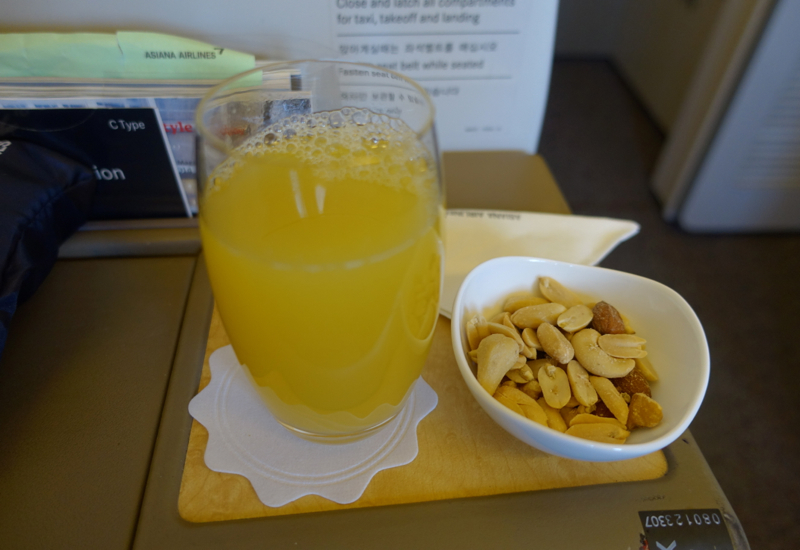 Later on in the flight, after sleeping and a few hours from landing, I decided to try the snack, again from the Korean menu. 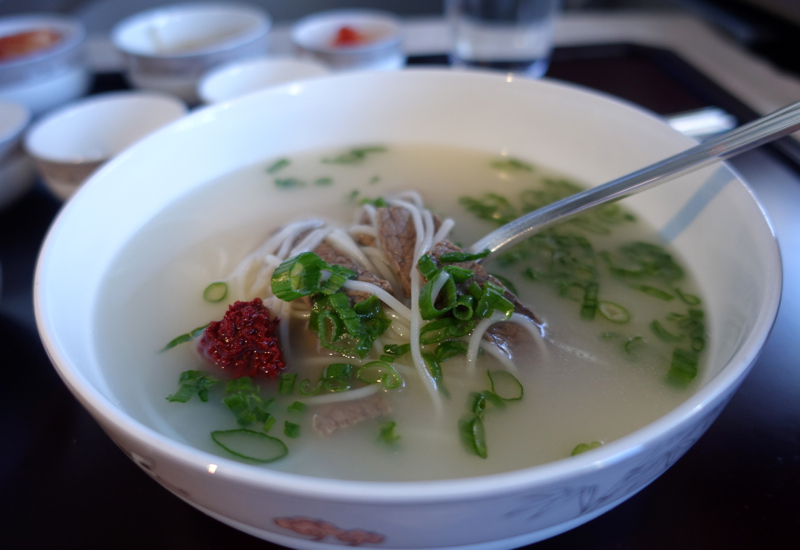 It was Gomtang, also called Gomguk, and described as a traditional beef rib soup. It's very plain, and has been boiled for a long time, so I found the broth extremely bland. Even after adding all the red chili paste, I didn't care for this dish nearly as much as the lunch of bibimbap, or other comfort soups such as Vietnamese pho. Still, I'm glad I tried it for the novelty, even if I wouldn't order it again. 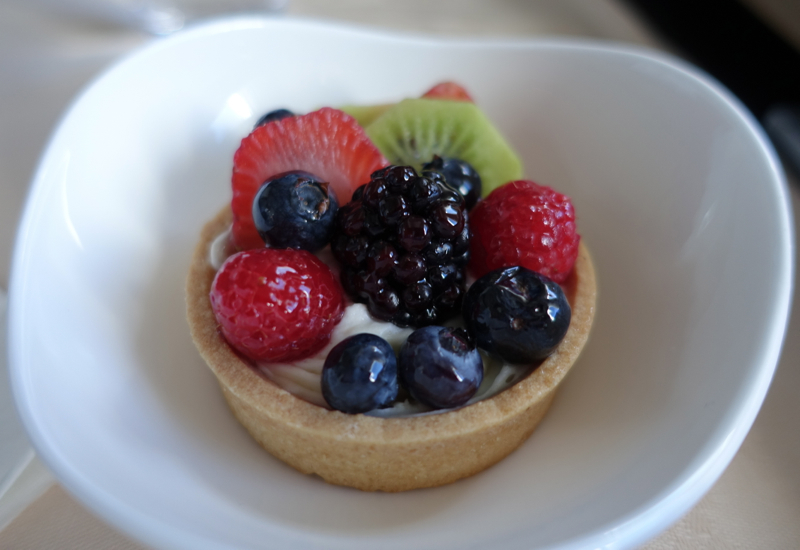 As before, I asked if I could substitute the Western dessert of Fruit Tart, and this wasn't a problem. I preferred this to the raspberry mousse cake, even if the raspberry mousse cake had a prettier presentation. As I hadn't finished the Gomtang I was still a little hungry, so I asked if by any chance they had a cheese plate left from the lunch. They did, and were happy to serve it to me. 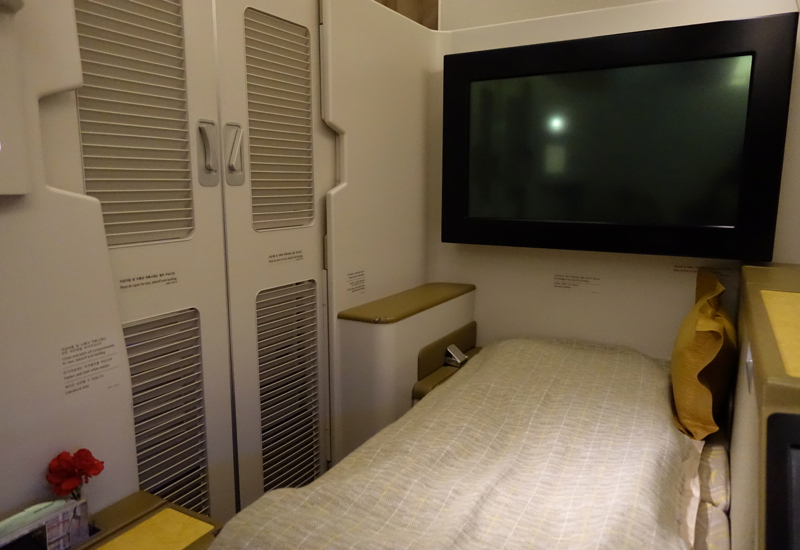 Asiana first class offers a suite with closing doors, so it rates well in privacy, although I don't find the bed as comfortable as other products such as Singapore Suites, which has a great memory foam mattress pad. 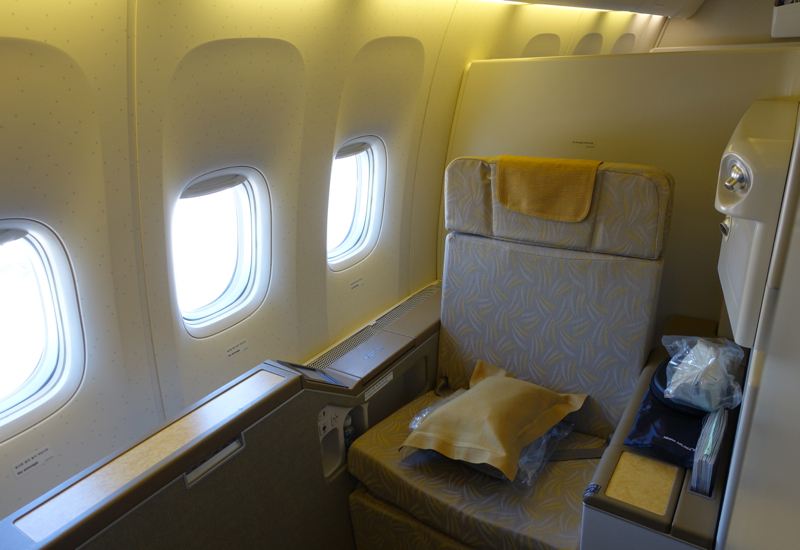 On Asiana, the mattress cover is very thin, so it doesn't add much in the way of comfort. What you can do, and what I did, is use the provided blanket for some extra padding, especially as the cabin isn't that cool and the pajamas are on the thicker side anyway. I slept ok for a few hours, thanks also to a sleep aid and my own earplugs, and those that are sounder sleepers than I am should be fine. 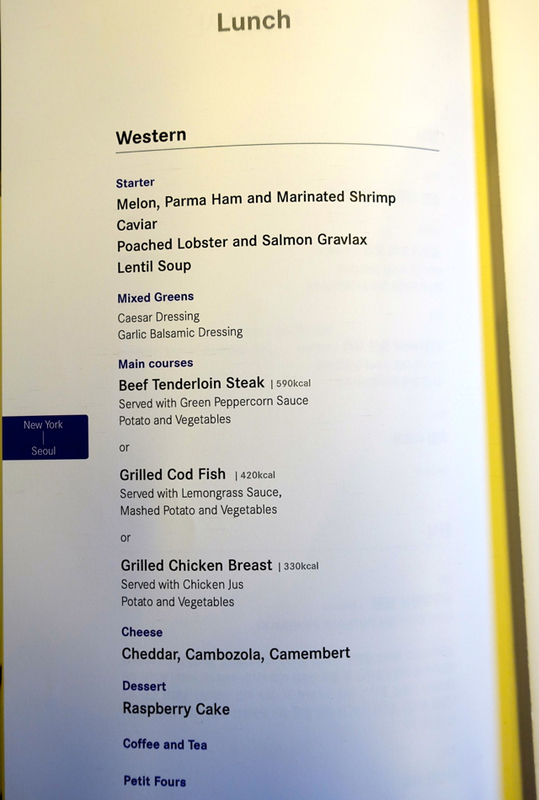 In terms of the service quality I've experienced on my Asiana flights, I'd put them lower than the top Asian carriers such as Singapore Airlines and Cathay Pacific, but above European carriers such as Lufthansa and SWISS. They were polite and accommodating of my requests for various menu substitutions, and happy to assist with anything when asked, although not as proactive as I'd have wished. For example, when I went to the bathroom to change, no one made and turned down my bed–I had to ask for it when I returned, and stand awkwardly in the aisle. Similarly, once I got up and changed back, no one put away my bedding, so I bundled it up myself and put some of it next to the window, where it stayed the rest of the flight. Asiana First Class Suites are an excellent option to North Asia, for destinations within easy reach of Seoul, especially for those with an abundance of United MileagePlus miles, LifeMiles, or other non-KrisFlyer Star Alliance miles, which can't be used to book Singapore Suites or First Class. The hard product is good, with private suites and closing doors, as well as the ability to dine across from a companion since the ottoman doubles as a companion seat. The food aspect of the soft product is also very good, with both Korean and Western menu options, a nice caviar service, and good selection of wines on offer. Service isn't as polished or as stellar as on the top Asian carriers, so it pays to be proactive and request exactly what you'd like. 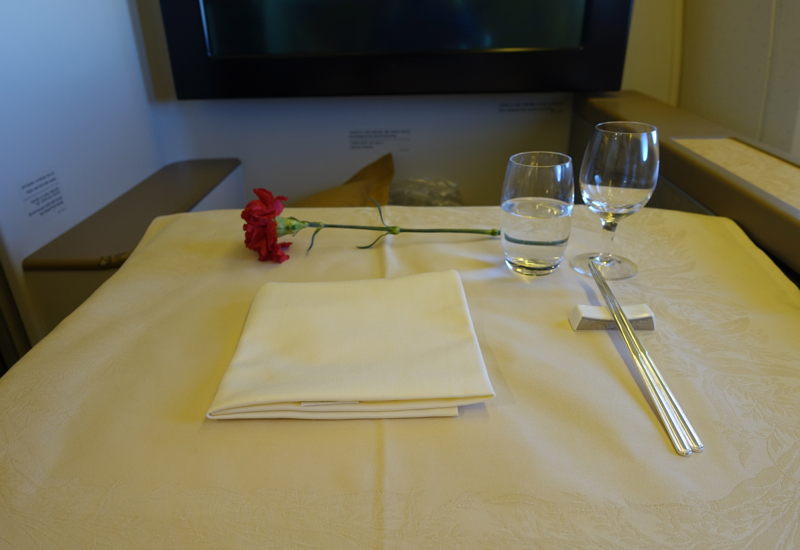 If you've flown in Asiana First Class, what was your experience?